High E, as people call it, is a striking line about halfway down the cliff. It's a "5.6+", by Gunks standards. 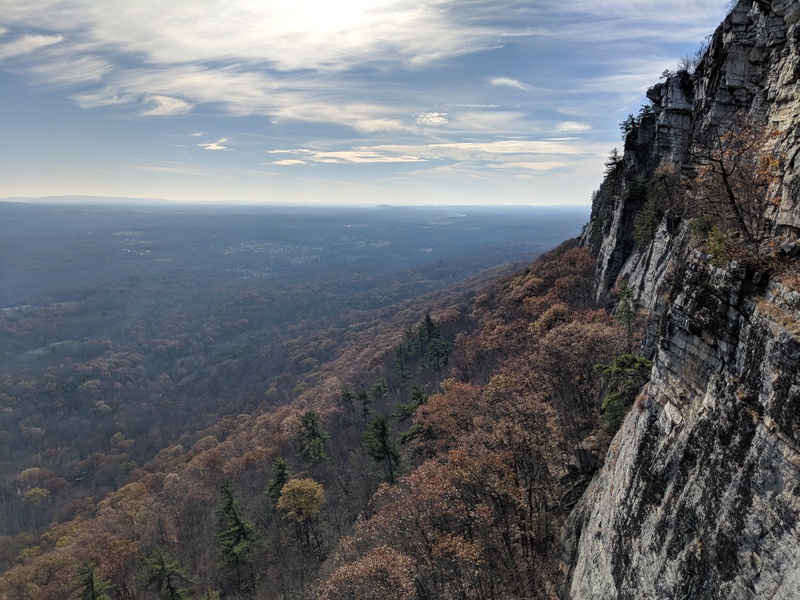 (The Gunks are notoriously sandbagged -- what they call a 5.3 might be something that we wimpy Californians climbing at Lover's Leap would call a 5.7.) It follows a corner all the way up to the "Grand Traverse" ledge that follows the entire length of the cliff; then, from the ledge, the route zig-zags past a corner into a roof, and up a sustained slightly overhung jug haul (i.e., pulling on very positive holds, with your body leaned back into space). Two years ago -- November, 2015 -- I came across a wonderful photo of High E, and linked it to my friend Josh Keller on IRC. We decided that we had to do it. So I resolved to up my game in leading on trad gear, and he'd train up, too. 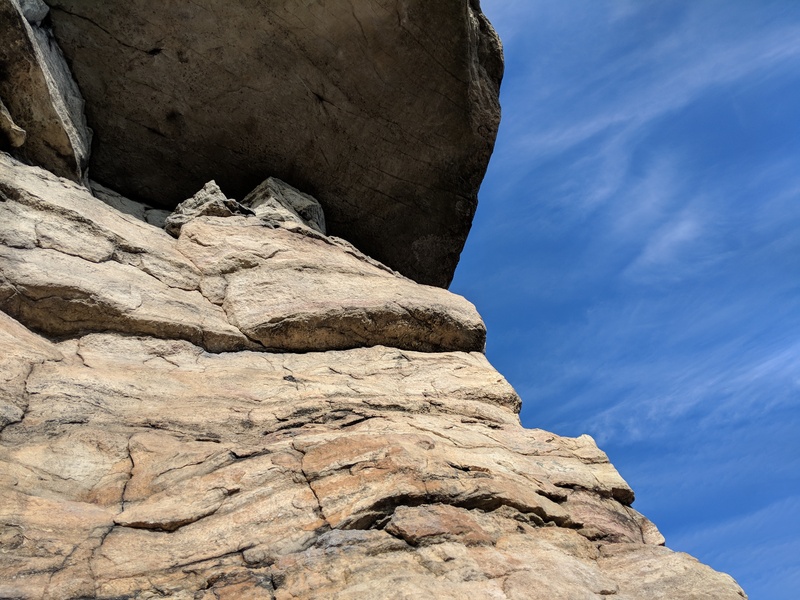 The next year, I happened to be in the Boston area around the general Labor Day time, and we took two days to head down to New Paltz and get some Gunks climbing for ourselves. We found ourselves struck by what the place was -- and clearly full of the knowledge that we had no business getting on High E that trip. We got on Betty (5.3) and Belly Roll (5.4) the first day; the second day, we got on Three Pines (5.3) and Beginner's Delight (5.4). After getting suitably scared on the traverse of the second pitch of Beginner's Delight, we felt good about our choice not to try a "classically spooky" 5.6+ route. We came back again around Thanksgiving of 2016, too, making a day trip for Betty (5.3) and Jackie (5.5) -- and this time bringing along another friend of mine, Chris Lu. We made plans to do it again. This Thanksgiving, we came to properly get after it. After our first day being a disaster trying The Dangler (5.10a), and managing to take all day to do a single route, I decided I was probably actually capable of leading High Exposure. So out we went Saturday morning. I racked up, and got to business leading the first pitch (5.5). I noted that I seem to have gotten a lot better at route-reading than last year: I finally can seem to identify some of the features that they're talking about in the topo, for instance, and after looking the length of the route, I felt I knew where it went. This was a lovely change from last year, to be sure. 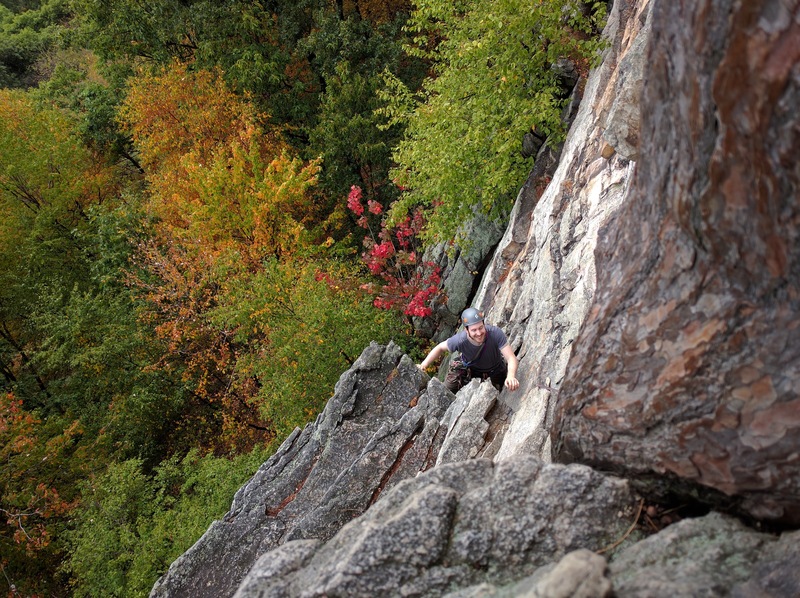 The first pitch, by any standard other than the Gunks, is great climbing. It's low-angle with the occasional puzzling move; the gear is good, and the only question is how to optimize your finite quantity of it. By the end, if you're trailing two followers, the rope drag becomes kind of absurd, as with each step, you're hauling up nearly 100m of rope's weight below you. 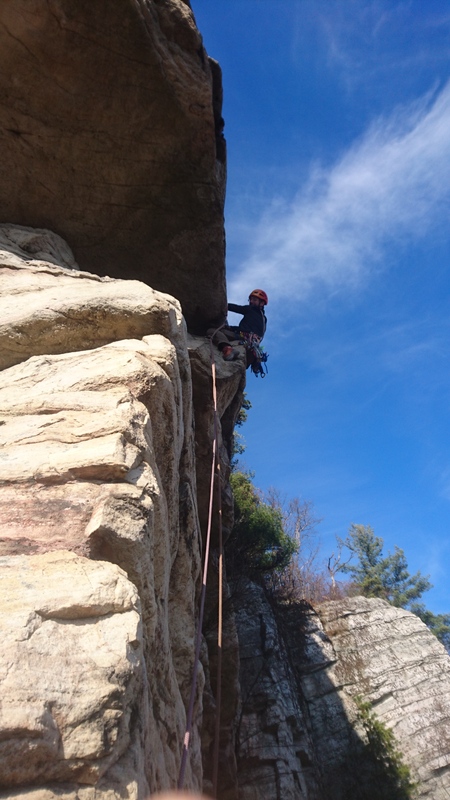 (I think the closest I came to falling was on the easy moves into the Grand Traverse ledge, simply because the rope was trying so hard to pull me off!) It has a few moves at grade, but the vast majority of it is just puzzling your way up. Somehow, I found my puzzle solutions often involving stepping incredibly high with alarming regularity -- perhaps a sign that I had not quite figured out how to effectively use my feet on the terrain that I was on. I deliberated at the ledge for a while. Ultimately, I came to the conclusion that the first pitch seemed within my ability, and I was pretty sure that I could always back down if I needed to -- I figured that most of the moves I'd make would be reversible, and if I found a move that I didn't think I could reverse, then I'd stop there. So away I went, finding my way up the beginning, which was about a 15-or-so move V-easy boulder problem. The guidebooks all said "follow the heavily chalked holds", and away I went, choosing my own adventure. And moments later, I found myself at the start of the serious bit of the route: to start with, you're crammed onto a ledge with a horizontal-seeming roof over your head, and then seemingly a few motions later, you've got to puzzle a way out to find yourself onto a face, slithering out somehow back onto vertical terrain. I had watched video after video of people placing gear, and then somehow making what everyone refers to as "The Move", but all of the videos in the world don't prepare you for just finding a way that works for your body's geometry to do it. There are lots of options, and ultimately, there are fantastic holds to reach for just as you get onto the face. The rest of the route is, in theory, gravy from there. It's a little bit steep -- maybe vertical, or even just a hair over -- but the holds are fantastic the whole way. Knowing what I know now, and having done it, I can assure you that anybody who's got the endurance to lead the easiest route on their local gym's lead wall can do the second pitch of High E.
Of course, that's knowing what I know now. In the mean time, once I pulled onto the face, I found myself terrified, clinging to each hold as if it would be the last good one on the route. This one was really good, and so was the one before that, but the next one might not be! Am I sure that I'll be able to place gear up there? I found myself so caught up in the terror of the route that I didn't even notice the wild surreality of the exposed position I was in. Somehow I kept chugging along, moving up a foot, moving up a hand, moving up a foot, moving up a hand, shaking out, chalking up, maybe occasionally placing a piece of gear -- and then doing it all again. It was a very focused affair, doing the work of climbing a route that was physically easy, but mentally very challenging. And then, before I knew it, I was done. On the top, and the horror of the route was over, and now all I had to do was belay Chris and Josh up behind me. The second pitch felt like what I'd call 5.10c or so at Planet Granite -- or maybe 5.8 outdoors here in California. But doing it again, knowing in my body and in my mind that I can do it? I'd go back in a heartbeat, prepared to bask in the sheer joy of High E. It'd be a totally different experience. 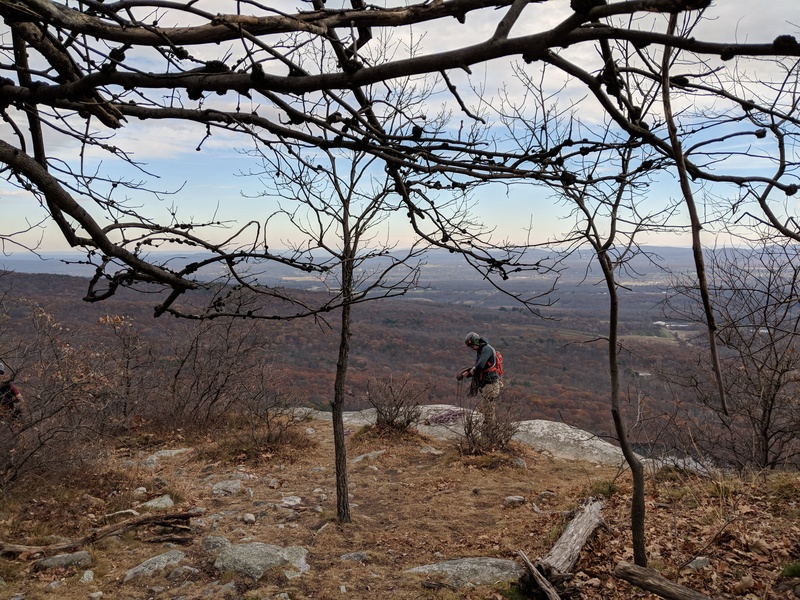 If you've lead other lower-grade routes at the Gunks, and you've gotten yourself scared there once before, and you've got the endurance to do it, get on High Exposure. And even if you don't think you'll ever even want to High E, drive yourself over to the Gunks sometime and just spend some time on the wall there. You won't regret it. Oh, by the way: if you don't have a Dreamwidth account, but you want to get notified so you can read more things like this when I write them, I also have an e-mail list that you can sign up for. I promise I'll only send mail for things that I write that go here on this blog. So, you know, if that's your thing, there you go. i motorcycled through the gunks a few years ago, knowing about this particular kind of climbing mecca, and it looks so god damned appealing. someday, i'll be a strong enough climber to really merit a trip (or ten) out there...!